A crane in the lefthand lane on Chestnut Street between 41st and 42nd Streets, as seen from the 21 bus, in Philadelphia in December. A new online resource with detailed information on street and sidewalk closures is giving Philadelphians the ability to easily track whether the worksite has the required permits. The interactive map from the Streets Department provides a view of work that disrupts Philadelphia’s streets, with blue lines indicating a partial street closure, green a sidewalk closure, and red a total street closure. The site is comprehensive, cataloging all closures, including those due to street maintenance, utility work, and construction. Even a brief closure caused by someone moving into a new home is cataloged. The information on the site updates every 30 minutes. A user can click on any location within the city, or search by address, to see the work being done, and the right-of-way permit’s effective and expiration dates. The site also allows users to read the permits themselves. The map shows just how much is being done on Philadelphia’s streets at any one time. 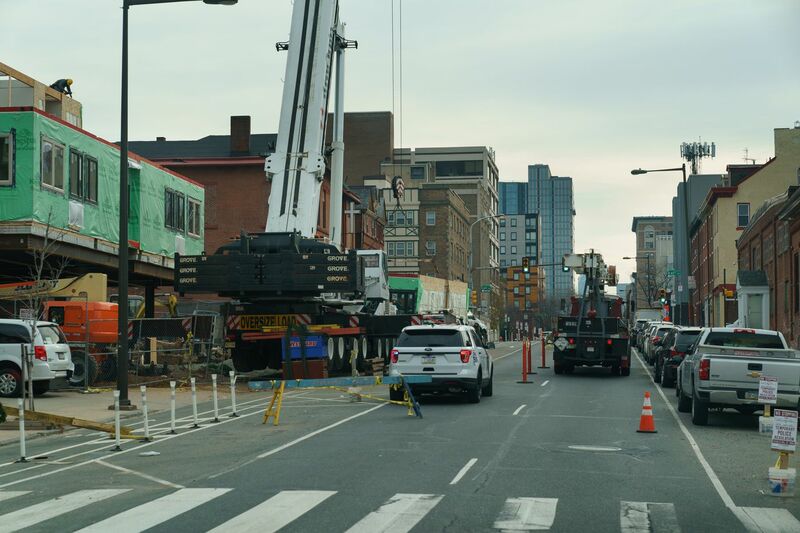 At 15th and Chestnut Streets, for example, there are 15 active permits, showing closures for conduit installation, high-rise construction, and window cleaning. There are about 2,000 active right-of-way permits in Philadelphia. City officials note these are a sign of prosperity, but they can also create major obstacles. In some places, there is virtually no accommodation for pedestrians, forcing people to walk in the street. Even when there are channels created that give people on foot a path, they can be difficult for those with disabilities or pushing strollers. In the process, construction sites also add to the city’s congestion woes. City officials acknowledge right-of-way permits are not sufficiently policed, with builders ignoring permit expiration dates and intrusions into travel lanes unnecessarily dragging on for months. The Bicycle Coalition was instrumental in encouraging the map’s development, LoBasso said, and since November has shared a preliminary version that covered just Center City through its blog. That generated 10 complaints, he said, but he hopes more will come. Philadelphia's new streets and sidewalk closures map offers a real-time view of right-of-way obstructions citywide. The city conducts at least one mandatory permit inspection for construction sites, but after that inspections can be ad hoc, and often happen only after the right-of-way unit receives a complaint, Iffrig said. His office created the map not just as a resource for the public, but as a way for his department to better visualize where right-of-way encroachments are, and how they are affecting neighborhoods. City officials acknowledge they need more enforcement agents than the six inspectors and two supervisors currently assigned to conduct inspections on right-of-way permits, far fewer than some cities that are smaller than Philadelphia. There are plans to increase that number, but for the time being the online map is designed to be a resource to create accountability. The map is the first resource of its kind in Philadelphia. Prior to its creation, the only way to get street closure information was to contact Iffrig’s department. Assembling the data and formatting it for the new web resource took about three months, city officials said, and cost $10,000, including management and testing expenses. If people find right-of-way blockages not allowed by permit, or if there are hazardous intrusions, Iffrig said, complaints can be made through the city’s 311 phone service or by email at Philly311@phila.gov. Iffrig said he would like to see the map provide more granular detail, allowing people to zoom in on a single street to see exactly how travel lanes are being interrupted or diverted, and how barriers and fences are installed.